With natural gas water heaters, combustion gases must be properly vented to avoid carbon monoxide issues and a working carbon monoxide alarm must be installed in spaces with combustion appliances. Atmospherically-vented gas water heaters rely on the natural draft of air upward into the flue to remove combustion gases. However, sometimes a backdraft (ambient depressurization that prevents the evacuation of gases) releases carbon monoxide into the immediate environment, which poses a health and safety risk. In an unconditioned garage, the carbon monoxide risk is low. But homes in the Northwest often have combustion appliances within a conditioned space. Placing a water heater next to another atmospheric or fan-assisted combustion appliance presents a safety risk: The two appliances compete for the same air mass and one wins while the other backdrafts. A clothes dryer installed near the water heater will also affect the unit’s effective exhaust. The best solution for venting water heaters safely is to install a power-vented or sealed combustion system, which does not rely on atmospheric venting. An alternative solution is to remove doors that confine the space and use interior air for ventilation. It is not recommended to bring in make-up air from outside the building envelope, because this increases air leakage between the house and the exterior. It’s also common for homeowners to seal these holes without understanding the increased risk of carbon monoxide poisoning. Heat pump water heaters also require special safety considerations. As an air-sourced model actively exchanges heat with the stored water, warm air enters the system and cold air is drawn out. This heat exchange tends to make the ambient space cold. Homeowners who have a conditioned space for their water heater seek units with ducting to vent the cold air outside the home. While venting supports efficiency and comfort, the cold exhaust air outside may depressurize the indoor air space. That can cause any atmospherically-vented combustion appliances nearby to lose necessary air and release carbon monoxide. 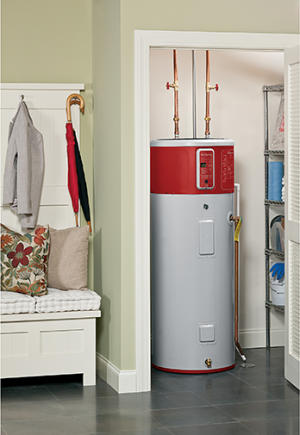 To safely install a water heater, take all aspects of a home’s system into account. Consider water heater performance and the effects of the operation on other appliances in the same space. Problems and solutions will vary greatly from one home to the next, and well-informed decisions and carefully conceived methods will ensure safer installations.